The Complete Fisher Forum :: View topic - Roundabout Kelso. Posted: Tue Nov 29, 2011 10:06 pm Post subject: Roundabout Kelso. This time you do not need to go too far across the border for very, very good burn fishing. All of these burns are within half an hour of Kelso. I have ignored the Tweed and the Teviot assuming you want something a touch more intimate and challenging. Aim for the village of Morebattle and there you will find the Kale which flows into the Teviot. There are signs mentioning the Morebattle Angling Club but I have never been able to find where it operates from and, importantly, have never seen another fisherman. Fishing is fast and furious with mainly eight to ten inch wild browns and many salmon parr. The one in the picture is typical, ten inches of spotted perfection that fought twice its weight on a seven foot rod and took a black spider. From Morebattle head for Yetholm and Kirk Yetholm, home of the Yetholm gypsies. On your right you will see the Bowmont Water. I am not sure but think the Bowmont actually crosses into England at one stage before looping back to join the Teviot. Lots and lots of willing wee browns but do not be surprised if a fifteen incher suddenly attacks your fly. Go slightly north east towards the village of Ancrum where you will find the Ale. This is a funny water; during the summer the trout seem to drop back down into the Teviot (very close to Ancrum and worth a cast or three) but if there is a decent flow browns, and some very good ones, are well in evidence. 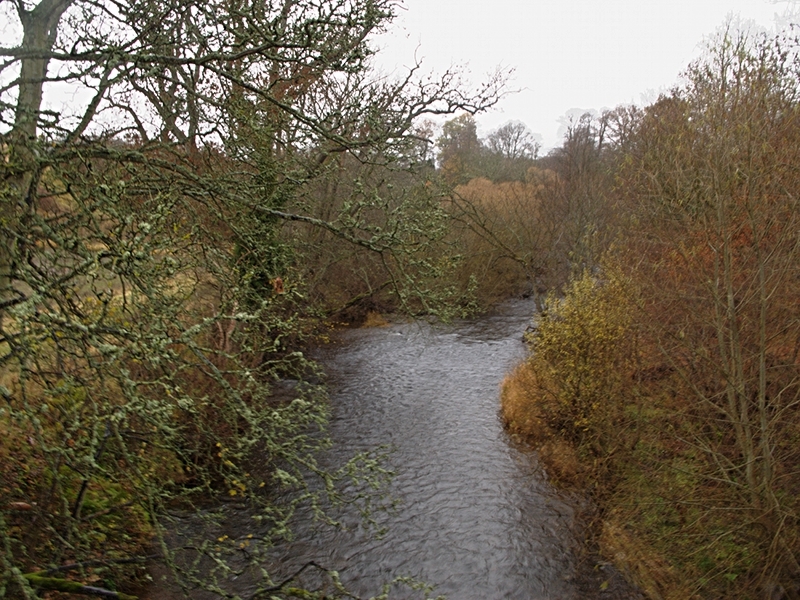 Later on in the season and into November some good shoals of grayling appear upstream of Ancrum. A bit further out and eastwards is the Jed. 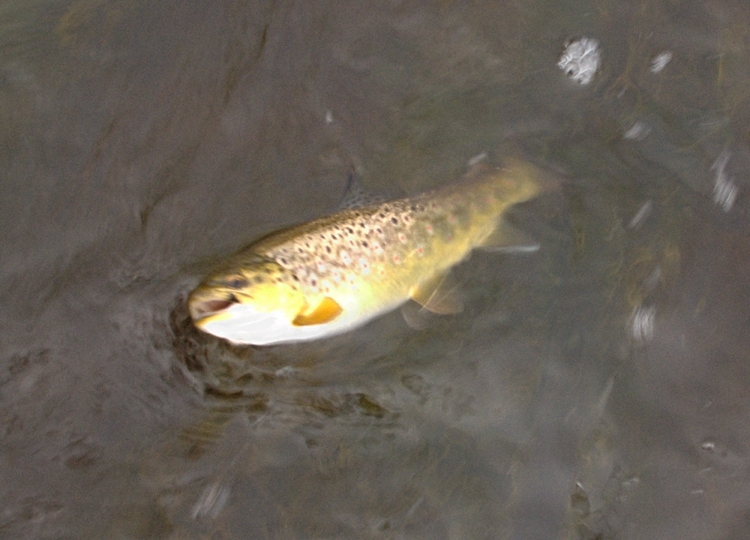 I have had some very big browns both upstream and downstream of Jedburgh. Very difficult fishing in some places and you will soon learn just how hard it is to control a big brown with trees and undergrowth all around. One of the best big trout waters in the borders. Northwards you will find the village of Earlston and the Leader Water. Believe it or not but it is the gospel truth � Earlston Golf Club is actually on the moon � check it out. Eighteen named holes and no one has ever played it. The river however is accessible � the Leader; a very good grayling water during the winter but also a very good trout water at other times. I prefer it upstream between Earlston and Lauder. As usual I have no idea what the permit situation is and have never been asked for one. In fact I have only ever seen another fisherman once. Just get in and fish, we Scots are a forgiving lot and understand that the English are easily confused in the matter of fishing law. If you are plainly fishing for brown trout there is never likely to be a problem. Get your rods out and try it but keep clear of the Orvis shop in Kelso unless you are a banker earning bonus. No criticism of Orvis intended in any way � I just wish I could afford it. Dare I write about Ayrshire some time? For some reason a couple of the pictures will not load. I will try later with the Jed and the Leader when I find out what has gone wrong!